When it comes to the framing of aluminium sheet / panels it’s very much a case of choosing ‘horses for courses’. Gooding Aluminium has developed high quality framing solutions to suit a variety of interior projects. Face fixed and ‘secretly fixed’ options are available. 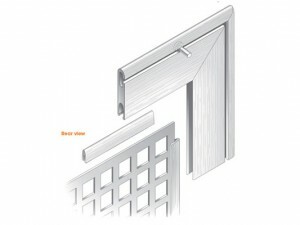 GA Posi-Grip is a two part extruded framing system with the inherent advantage of dry-mitre corner joints. Internal cleats tightly hold the corners together, avoiding the need for welding or chemical bonding. Decorative / protective anodised finishes can be successfully applied to the internally cleated and therefore weld-free corners of this technically advanced framing system. 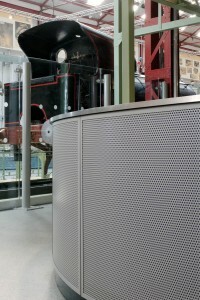 The outer frame is manufactured as one single profile; providing both strength and rigidity to the overall structure. The inner ‘snap-in’ section tightly grips the aluminium panel, thereby reducing the possibility of panel flexing. The inner section is available with alternative gap widths to suit 1.2 & 2mm thickness material. With all the positive advantages of GA Posi-Grip, our ‘Instant Access’ version also provides for service access with the easy removal of ‘secretly fixed’ panels. The absence of visible fixings offers the combined benefits of improved aesthetics and added security.